Discolored and broken teeth can have a negative impact on your self-esteem. Veneers offer a quick and efficient way to improve your smile by hiding imperfections in your teeth. 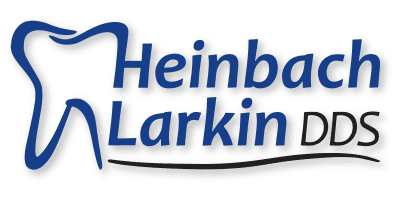 The dental team at Heinbach-Larkin Dental has extensive experience in cosmetic dentistry, which includes applying veneers to cover teeth that are chipped, uneven, and stained. Contact one of their offices in Topeka and Lawrence, Kansas, or schedule an appointment online to learn how veneers can provide the appearance you desire. Dental veneers cover the surface of your teeth, hiding imperfections such as discoloration, chipped teeth, gaps between teeth, uneven teeth, and stained enamel. They can give the appearance of straight teeth without physically moving the teeth with braces or clear aligners. Veneers also offer a treatment option for eroded enamel. The dentists at Heinbach-Larkin Dental offer exceptional cosmetic veneers. These veneers are made from thin shells of porcelain that match the color of your natural teeth and have a translucent quality that resembles enamel. Porcelain veneers are also strong and resist staining. At Heinbach-Larkin Dental, you can also choose from budget-friendly veneer options like composite resin veneers. The resin is tooth-colored and applied over the surface of teeth. When you come in for veneers, the first step is to prepare your teeth by removing a small amount of the enamel to create room for the veneer. Your dentist at Heinbach-Larkin Dental makes an impression of your teeth and helps you choose the color that matches your natural teeth. Using this information, a technician produces a porcelain veneer that’s a perfect fit for your mouth. When the veneers are ready, your dentist removes the temporary veneer used to protect your tooth after preparation. A special dental cement permanently bonds the veneer to the tooth. The process is a little different for composite resin veneers. The resin is applied directly to your teeth and artfully sculpted to cover the surface and create the desired shape. Then it’s hardened using a special light, and your veneer is finished. Porcelain veneers are quite durable, often lasting up to 20 years, while composite resin veneers last 7-15 years. Regular brushing helps keep your veneers clean and limits composite staining. Over time, your gums and teeth may go through changes that affect the veneers. Gum disease, receding gums, or a shift in the position of your tooth may change the way the veneer fits. Just like your natural teeth, veneers can break or crack. If that happens, please contact Heinbach-Larkin Dental to schedule a checkup and veneer repair. When the veneer is damaged, food and bacteria have access to the underlying tooth, which can lead to tooth decay underneath the veneer.